During the visit to any website, the average internaut may face scripts that upload personal information to so called online trackers, invisible third party services that collect information about users and profile them. This is no news, and many works in the past tried to measure the extensiveness of this phenomenon. All of them ran active measurement campaigns via crawlers. In this paper, we observe the phenomenon from a passive angle, to naturally factor the diversity of the Internet and of its users. 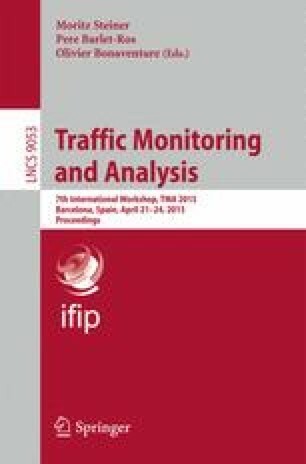 We analyze a large dataset of passively collected traffic summaries to observe how pervasive online tracking is. We see more than 400 tracking services being contacted by unaware users, of which the top 100 are regularly reached by more than 50 % of Internauts, with top three that are practically impossible to escape. Worse, more than 80 % of users gets in touch the first tracker within 1 second after starting navigating. And we see a lot of websites that hosts hundreds of tracking services. Conversely, those popular web extensions that may improve personal protection, e.g., DoNotTrackMe, are actually installed by a handful of users (3.5 %). The resulting picture witnesses how pervasive the phenomenon is, and calls for an increase of the sensibility of people, researchers and regulators toward privacy in the Internet. This work was conducted under the Narus Fellow Research Program.